"Some wear a provocative twinkle of a skilled dialectician, or have a raised brow of pedantry. They are too keen to decry others advertising themselves. They are like vultures flying high only to seek carrion over a wider circle," writes an aspirant who went around India seeking a Guru. Paul Brunton was advised to pray every day to God so that he may be led to the Man in whom God is at present incarnated. The Incarnation comes down through Love, and so, the mark of the Incarnation is above all, Love. Try and see yourself in all, then you will not love one person more and another less, realizing that they are both yourself. When love is shared peace reigns. All worldly relationships are based on the principle of give and take. The highest form of love is expressed between a devotee and God, the devotee being intent on merging with Divinity. Thereupon love flows towards everything and every being. According to Baba, God is Love; the lover is the individual, and the beloved, is nature. Knowing fully well that nature is under the complete control of God, why be under its spell? Realizing God's prevalence everywhere let us learn to love the Creator, since creation is nothing but His manifestation. Baba says that we should direct all our thoughts towards God. But we cannot do so until our minds are under control. It is only through protracted practice that we can succeed in living in God, that is, in Love through His Grace. Almost everything that goes wrong in the relationship of man with man, goes wrong because the self-impulses outweigh the altruistic impulses, or because we overvalue the satisfaction of appetite and undervalue the satiation of our spiritual hunger. True happiness for human beings is possible only to those who develop their Godlike potentialities to the utmost. This is the way to God, known as the path of Love. In the Gîtâ, [BG : 9-34] the Lord said, "The Lord, O Arjuna, is seated in the hearts of all beings; fix your mind on Me, be devoted to Me, sacrifice to Me, prostrate before Me, so shall you come to Me." You have no reason to fear God, for love transcends doubt and fear. Love God as a companion, and respect Him, as a devotee must. Baba becomes childlike in the company of children, a scholar among scholars, a doctor among doctors, out of His Love, for He wants to put everyone at ease. Feeding the poor, service to those in jails, visiting the deaf and the dumb, the blind, leprosariums, mental hospitals, these have been laid down by Him as the highest Sadhana. "When you sit for Japam or Dhyana, if you hear one groan, rise and investigate. Helping the person to get rid of the pain gives you more spiritual merit than the Dhyana you miss." Baba's love for his devotees is expressed in many ways. Once at Dharmakshetra there was a gathering of teachers of the Bal Vikas in Sathyadeep. After the meeting commenced, the Bhajan party from below the hill was also invited to join. Hurrying up the steep incline many were short of breath, but one elderly lady seemed to suffer a great deal. Baba made her sit down leaning against the wall, under a fan. Then He disappeared for a moment, only to reappear with a glass of water which He gave the lady to drink. He cannot tolerate any one standing in the sun waiting for Darsan and is bothered when, due to rain, devotees are drenched. During the hot summer months, Baba allows the Prayer Hall at the Nilayam to be used by old or sick women to sleep in. It is Love that prompts Him to distribute sweets to each individual Himself, though there be thousands present, and to eat ever simple food, so that even the poorest person may offer Him hospitality. The practical application of Love is clearly seen also as Baba walks gracefully between lines of people, who wait patiently, to be selected, for a private interview. Ailing children are picked out for a special blessing; they are spoken to or given Vibhuti! The sick, the aged, the socially spurned and economically backward are all dearly loved by Him and cared for. 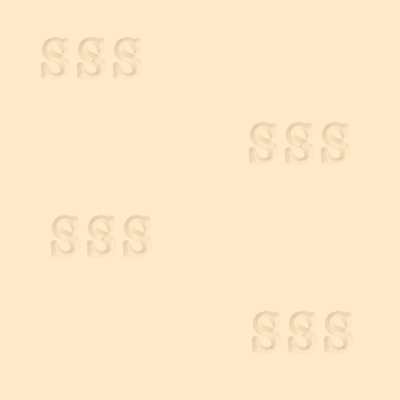 He uses a Telugu proverb to assure you that however far you may sit, or however many the number of people around you, He will spot and bless, provided your prayer is sincere. 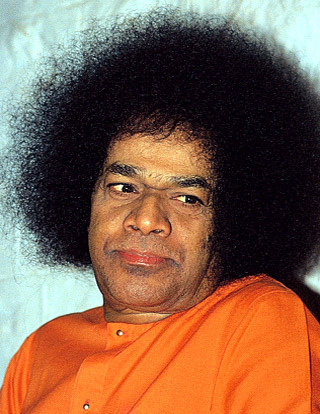 He says, "You are of the Sai Body - be happy that you are a limb - do not complain that you are only the foot, or be proud that you are the head, for it is the same blood stream of Love that circulates and sustains both!" When people come to Him, pathetically crippled, unable to bend and touch His Feet, He raises a Foot so that it can confer the healing balm of peace! "I always anticipate the prayer, the moment of calamity for my Bhakthas, and I intercede in time to help them or save them," He says. He has spoken of the Seed of Love planted in the heart of men, sprouting in the family, spreading over kith and kin, the village, the community and finally bringing under its shade the whole of mankind. When teaching meditation, He directs the concentration on the flame or candle or lamp as the best. Baba is kind to all who serve Him in and through all, even in the littlest way. In the village of Bikkatti in the Nilgiri Hills lived a lame dog called Kuttan, meaning 'the lame one'. He was a very old loving dog, yet alert where strangers were concerned. Baba on visiting the village in 1962, walked down the carpets laid out for Him. Kuttan strained at the leash by which he was held lest he bounce on Baba! But Baba stopped and patted him and asked that he be let loose saying, "Bangaroo! Leave him alone, he is a pure atma." So Kuttan followed Baba up the dais, sat and listened to the Bhajans, and later followed Him into the kitchen where Baba, after blessing the food, asked that Kuttan be fed first! When he finished his meal he walked up the decorated dais and stood beside Baba's chair, watching the long lines of villagers having their food. After a while Kuttan placed his head upon 'Baba's footstool' and, within a few minutes breathed his last. Everyone felt that he was a pure soul; he was buried near the dais, in a flower-shroud. 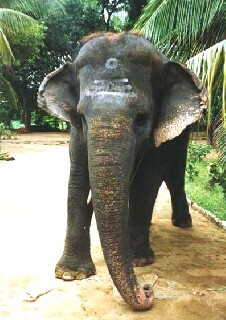 Baba has had many pets - dogs, rabbits, peacocks, and now the elephant Sai Gita who adores her Master so much that, should He be away for long, she sheds tears! If stray dogs are led away from the Nilayam so that the silence of the place may not be disturbed by their barking, instructions are issued that they be taken to a place where food is available. He asks, "Of what avail is it to simply worship My Name and My Form, without attempting to cultivate My Samathwa - equal love towards all, Santhi - unruffled equanimity, Prema - love, Sahana - patience and fortitude, and Ananda - blissful nature! I sing Bhajans after every discourse for your sake, not Mine, so as to enable you to become aware of the sweetness of the Name, which cleanses the mind, by which you can realize that God is ever with you in your physical and spiritual being." God has, it is said, two types of deluding powers, Avidyamaya and Vidyamaya. Sometimes His Maya makes us feel that He is a mere human, and we partake of acts which inflate the ego, making us feel important and all powerful. The fog of pride hides the Reality. This is Avidya. When we submit to His Will, He shows signs and wonders that make us eager to follow the right path. This is Vidyamaya, from which we learn that it is in Him we live and move and have our being. 'He' and 'we' are one. Only thus do we cleanse and purify our attitudes, habits and judgements, and discover God in His true Manifestation, that is, as living in all things created. The recognition that we and others are mere puppets in His hands will be imprinted on our consciousness through the meaningful recitation of His Name; then we start dwelling in Him, through Him, and for Him. People from all parts of the world who have had the privilege of being near His Lotus Feet try to remodel their lives, change their world view, and their sense of values. This silent psychological revolution affecting lakhs of people illustrates the Gift of Grace. 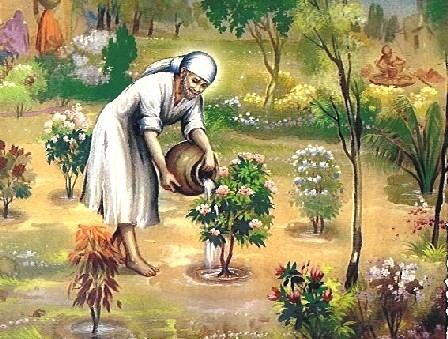 The real Sadhana, according to Baba, is to rake up the field of our heart and to cultivate in it the most valuable crop we can. The heart is the field, and in that field we have overgrown valueless weeds. Keep waters of love for the seeds. Then plough it with Sadhana. Those seeds will grow up and give us the crop of Jnana.